Now, our binary file is ready to execute. 3. Turn Off Random Virtual Space Security Feature. I know, exactly now, a new question rise in your mind that what is random virtual space security. 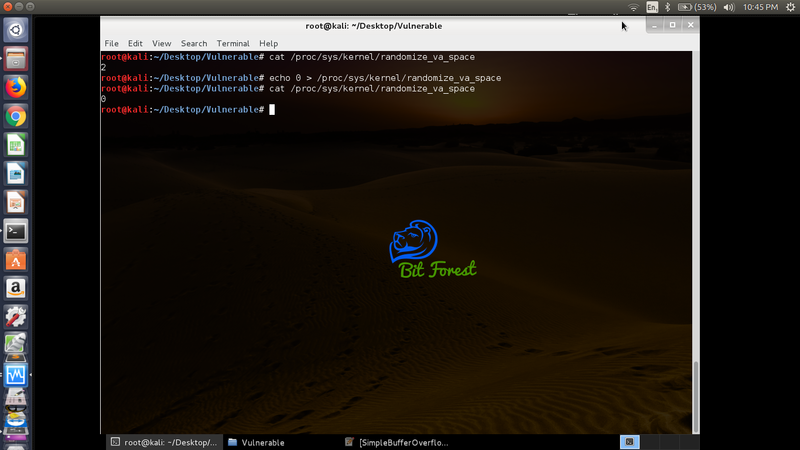 basically, New Linux kernels, come with security features which change allocated virtual space address every time during execution of the program. Hence, this feature makes buffer overflow exploitation more difficult to implement. 4. Run Compiled Program And try to smash it stack. Now, Our Vulnerable environment and a 32-bit vulnerable binary program are ready to use. 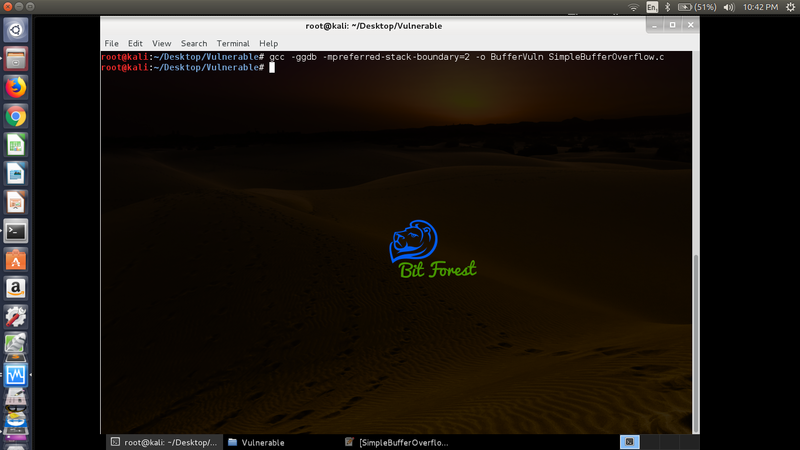 Before trying to exploitation, let's test this program normally. In this command preview, basically, printf is for printing output in terminal, "|" means piping argument from one program to another program and at the end ./BufferVuln is for executing the program. So, basically, we just piping printf function output into another binary file. 5. Disassemble File With Objdump. Now, Our Next setup is to create and enter a special type of hex code input that will help us to play with stack memory. basically, here in our compiled binary program, there is not any legal way left to execute the third function because, In our compiled program, the main function only calls the second function and then exit. so, our goal is to execute the third function with the help of stack memory overflow execution. As I already explained in my previous tutorials about stack memory, we just need to overwrite the return instruction into stack memory located after the empty memory blocks, allocated for buffer char character from the second function. 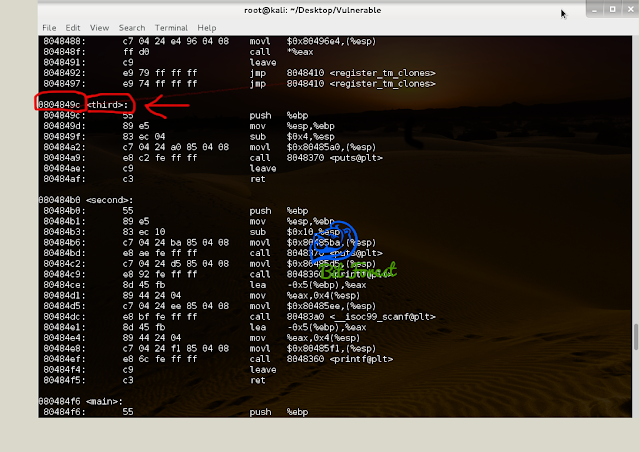 Well, To overwrite return instruction of the second function from the third function starting memory block address into the stack, we need to find the exact starting memory block address of the third function and for this purpose, here we are going to use objdump program. this program provides us the facility to extract program functions and instruction with there memory block addresses and machine codes. As you can see in above image, In my virtual box our third function memory address is 0804849c. (Note: Memory Address In your System will be different). After finding exact memory block address of the third function, now our goal is to insert that third function address in place of second function return address stored in stack memory. Simplest Format Of Stack Memory Layout to represent our plaining. As you can see in above format, char has an 8-bit limited size, empty memory blocks but because of scanf function disability (scanf don't check input data size before storing it into the stack). so, we are going to insert data (size of 12-bit). Method Of Inserting Memory Address Through input function. Basically, For this, we just need to insert memory address in the form of hexadecimal in reverse. So, Now Our Hexadecimal is ready to inject in the program. 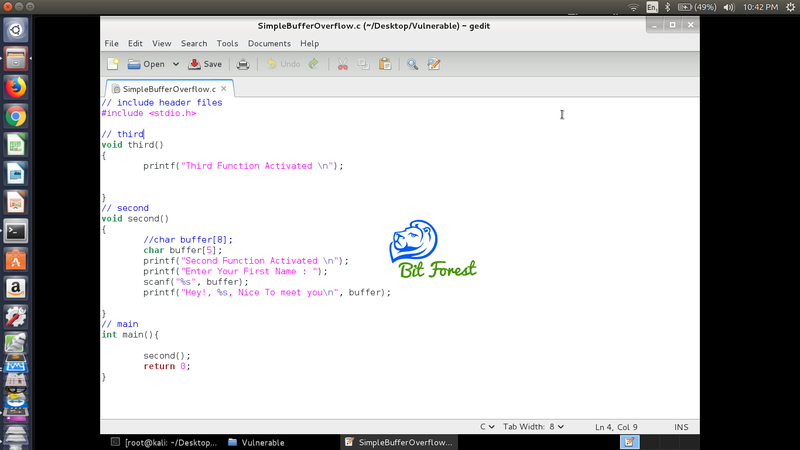 So, As You can see in above image, the Third Function executed successfully. This tutorial ends here. I hope you all enjoyed it. For any further Question Or Suggestion Comment Below. In next tutorial, we will do more advanced exploitation.